Daddy's Blind Ambition: What does your shirt say? The shirt serves a few purposes. 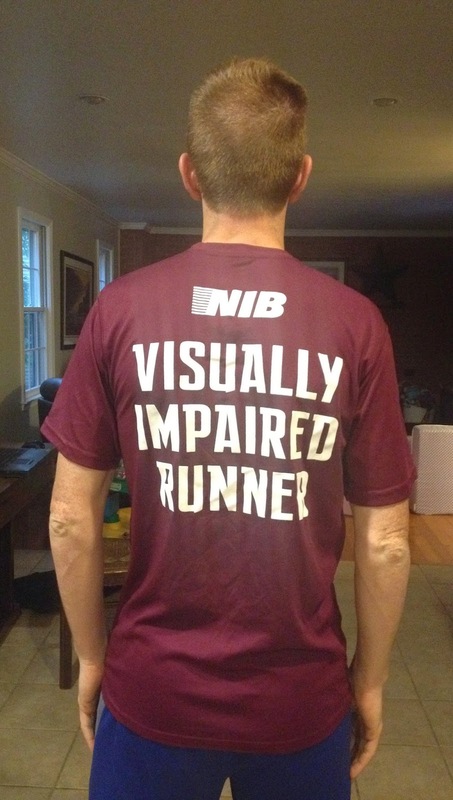 First, it is basic identification so fellow runners know he is visually impaired. Not everyone really thinks he is visually impaired, even with the shirt on since he doesn’t use guides or walk with a cane. For example, he did a turkey trot last year and the race was more cross country so Matt had problems with his footing. (Totally my fault—I found the race and didn’t look at the course closely enough though the website did say it was paved.) There was a fellow runner about Matt’s pace and the two of them kept passing each other. Finally the other runner asked if Matt was really visually impaired after Matt missed a marker and ran an extra few yards too many. For the rest of the race he called out turns and anything in race path for Matt. Thanks to him, Matt finished unscathed. We found out after the race that is also from Pittsburgh. Second, it raises awareness. A fellow runner stopped Matt after a race last year and asked him about his vision after seeing him out on the race course. Raising awareness on the capabilities of the visually impaired is always a good thing! Third, it asks for help without requiring Matt to ask for help. Matt stopped at the grocery store after a run with the girls and was trying to pick up a few things for dinner. He didn’t have a magnifier with him. Store workers offered to help him find everything he needed. At first he couldn’t believe how helpful everyone was being and then he remembered which shirt he had on. It saved me from having to send him back for ricotta instead of sour cream or flour instead of sugar. And finally, an added bonus is that if Matt cuts someone off at a race unknowingly, maybe the other runner will be less annoyed or less likely to yell at Matt when he sees the shirt. Matt’s not one to ask for help or to make any public decrees about his vision, so this shirt lets people know without the bull horn. Matt and I ran at lunch yesterday and even the off-and-on rain didn’t keep the tourists away from the National Mall. It has been a zoo lately. I called out to some people so that they could move over so we could pass and not accidently run into them and a woman growled at me. Seriously, she growled. I hope she saw the shirt. Not that her unwillingness to move over for a runner has anything to do with Matt being visually impaired, but if I hadn’t called out, Matt could have run into her. I wonder what sound she would have made then. That's funny, would it be wrong for me to get one of those shirts for running on the Mall too? Might help. And maybe the shirt did work, afterall, she growled at you . . . not Matt.